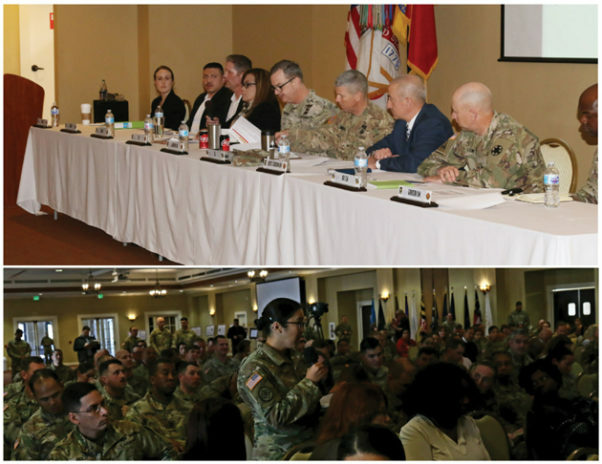 FORT IRWIN, Calif. — Fort Irwin military leaders are addressing a recent, national report that looked into the living conditions of families in privatized military housing. Commanding Brig. Gen. Jeffery Broadwater, as well as Garrison Commander, Col. Seth Krummrich and their staff have been working with RCI/Housing to ensure residents have housing that is safe, healthy and satisfying at the National Training Center. On Feb. 13, the Senate Committee on Armed Services Joint Subcommittee heard from military families who complained of mold, mice, rats, roaches, asbestos, lead in the water and leaking ceilings in their military housing that is owned by private companies. Soldiers and their families at the National Training Center have been fortunate enough to live in a safe, clean, healthy and high-quality environment, as Housing confirms Fort Irwin has not been bombarded with work orders pertaining to those kinds of issues. The communities consist of privatized housing managed by Michaels Military Housing. Michaels is among the privatized housing companies that will be a part of a focused inspection across dozens of military installations to ensure military residents continue to have accommodations that meet or exceed all standards and provide the quality of life that is expected for Soldiers, civilian employees and their families. The Commanding General and Garrison senior leaders, along with Housing directors held a Town Hall on Feb. 27 that answered dozens of questions both in person and digitally, through a Facebook Live source. More than 300 Soldiers, spouses and civilians attended and hundreds watched online. There is another Town Hall on April 1 that will also address housing concerns and key military leaders will be visiting houses across the installation over the next several months. The Secretary of the Army, Mark Esper, said the military is committed to its Soldiers and will hold military chain of command and private contractors accountable. Housing will continue to listen to and address any of the Fort Irwin community’s concerns, including service, repairs, updating, and renovating, swiftly and as needed, and will do so with care and concern. Housing encourages residents to continue to provide feedback and share their concerns, so that together we can ensure complete satisfaction. There is an emergency hotline that residents can call for major housing concerns at (760)380-7777. Residents are also encouraged to participate in one of the three, upcoming DAIG Town Halls (March 4 at 2p.m. and 6p.m. and March 5 at 10a.m. ); and to participate in the April 1 Town Hall on the summer PCS season and Housing with the Commanding General; to continue to ask questions on the weekly Garrison Facebook Round-up each Wednesday at 2:30p.m. ; and residents can continue to file housing work orders and ICE complaints, if needed. Leadership has begun personal housing visits to tackle concerns. During the Town Hall, Housing entered work orders in their system in person with residents and Housing scheduled face-to-face meetings while at the Town Hall.